The Trump Tower meeting took place on June 9, 2016 in New York City between three senior members of the 2016 Trump campaign – Donald Trump Jr., Jared Kushner, and Paul Manafort – and at least five other people, including Russian lawyer Natalia Veselnitskaya. The meeting was arranged by publicist and long-time Trump acquaintance Rob Goldstone on behalf of his client, singer-songwriter Emin Agalarov. It was disclosed to U.S. government officials when Kushner filed a revised version of his security clearance form. Donald Trump Jr. made several misleading statements about the meeting. He initially told the press that the meeting was held to discuss adoptions of Russian children by Americans. On July 8, 2017, after news reports stated that Trump Jr. knew the meeting was political, he admitted in a tweet that he had agreed to the meeting with the understanding that he would receive information damaging to Hillary Clinton, and that he was conducting opposition research. When the New York Times was about to report on email exchanges between Goldstone and Trump Jr., Trump Jr. himself admitted that Goldstone had stated in an email to him that the Russian government was involved and that the purpose of the meeting was to get "dirt on Clinton" and that the meeting concerned a "Russian effort to aid the (Trump) campaign." In early July 2017, it was reported that President Donald Trump himself drafted Trump Jr.'s initial misleading statement. The report was later confirmed by the president's attorneys. In July 2018, the president denied knowledge of the meeting. Robert Mueller, the special counsel of the Department of Justice in charge of Russia-related investigations, investigated the emails and the meeting, and their relation to the Russian interference in the 2016 United States elections. Prior to the Trump Tower meeting, Trump campaign advisor George Papadopoulos met at least twice with a professor who said he had access to "dirt" on Hillary Clinton in the form of "thousands of emails". This occurred before the hacking of the DNC computers had become public knowledge. Papadopoulos later shared this information with at least two other people, including an Australian diplomat to Britain. At a meeting on March 24, 2016, the professor brought along a Russian woman, Olga Polonskaya. Papadopoulos made multiple unsuccessful attempts to set up meetings in Russia between Trump or members of his campaign and Russian officials. He communicated his proposals and interactions to several Trump campaign officials. In October 2017 he pleaded guilty to one count of making false statements to the FBI about his actions. On June 3, 2016, before the public was made aware of potential Russian interference in the presidential election, Donald Trump Jr. was contacted by Rob Goldstone, a British music publicist whose association with the Trumps dates back to the Miss Universe 2013 pageant held in Moscow; at that time, Trump Jr.'s father, businessman Donald Trump, had been co-owner of the pageant. Goldstone's client, Emin Agalarov, an Azerbaijani singer, performed at the Miss Universe event. His father, Aras Agalarov, is a wealthy real estate developer in Moscow. The Crown prosecutor of Russia[a] met with his father Aras this morning and in their meeting offered to provide the Trump campaign with some official documents and information that would incriminate Hillary and her dealings with Russia and would be very useful to your father. In a June 7 email, it was agreed that the material would be delivered to Trump Jr. by an unnamed "Russian government attorney". At the meeting, Goldstone introduced this person as Moscow-based attorney Natalia Veselnitskaya. She stated that she was not a government official, however she is known to have ties to the Russian government and later described herself as an "informant" to the office of the Russian prosecutor general. According to Goldstone, she had planned to be in New York for a court appearance on June 9. Trump Jr. offered an in-person meeting that afternoon, which Goldstone confirmed. Trump Jr. forwarded the email thread to Kushner and Manafort. The arranged meeting took place at Trump Tower in the afternoon of June 9, 2016. At least eight people attended. When the meeting first became known, conflicting accounts of who attended circulated. With time, more names came forward. At first, Donald Trump, Jr. did not disclose that Irakly "Ike" Kaveladze, Rob Goldstone, and Anatoli Samachornov attended the meeting. Jared Kushner, Trump's son-in-law, responsible for the campaign's digital, online, and social media operations. Paul Manafort, campaign manager for the presidential campaign of Donald Trump from 29 March 2016 to 19 August 2016. He was formerly a lobbyist. Donald Trump Jr., eldest son of Donald Trump, active in the presidential campaign as a key political aide and advisor to his father. Natalia Veselnitskaya, a Russian lawyer best known in the United States for lobbying against the Magnitsky Act. According to the New York Times, in Moscow she is regarded as a "trusted insider" who has argued cases for government agencies and high-profile clients including Pyotr Katsyv, an official in the state-owned Russian Railways, and his son Denis, whom she defended against a money laundering charge in New York. She has also been an informant in active communication with Yury Chaika, the Russian prosecutor general, since 2013. Starting in 2014, she had worked with Fusion GPS, the firm that was later hired to do opposition research on Trump, to investigate an unrelated money-laundering case involving Prevezon Holding, and the "dirt" she brought with her to the meeting stemmed from that work. The work on the Prevezon case, and later on the dossier, were completely separate, and Fusion GPS co-founder Glenn Simpson testified before the Senate Judiciary Committee that they were unaware that Veselnitskaya would meet with Trump campaign members or share anything from the Prevezon case with them. Rob Goldstone, the publicist of Emin Agalarov, who said that Agalarov asked him to contact Trump Jr. New York attorney Scott S. Balber, who was retained by Emin and Aras Agalarov, denied that Goldstone's emails accurately outlined the origins of the meeting. Anatoli Samochornov, a translator for Veselnitskaya. In the past, Samochornov worked for Meridian International and did contract work for the U.S. State Department as an interpreter. Samochornov is not an employee of the State Department. Trump Jr. initially told reporters that the meeting had been "primarily about adoptions". He then released a statement saying it had been a "short introductory meeting" concerning "a program about the adoption of Russian children". A few days later Trump Jr. acknowledged that he went into the meeting expecting to receive opposition research from Veselnitskaya that could hurt Clinton's campaign, adding that none was presented and that the conversation instead focused on the Magnitsky Act. Later a statement from Trump Jr.'s lawyer said Veselnitskaya had claimed to have information "that individuals connected to Russia were funding the Democratic National Committee and supporting Mrs. Clinton" but "it quickly became clear that she had no meaningful information". Trump Jr. said he felt the adoption issue was her "true agenda all along" and the claims of helpful political information were a pretext. After learning that the New York Times was about to publish the series of emails setting up the meeting, Trump Jr. himself published the email chain via Twitter, and explained that he considered the meeting to be "political opposition research". He summarized the meeting as "such a nothing... a wasted 20 minutes". Veselnitskaya said that she intended to provide allegations to the Trump campaign about a firm connected to William Browder, a financier who lobbied for the Magnitsky Act. She said that the firm committed tax evasion in Russia and donated to Democrats. She said in an interview, "I never had any damaging or sensitive information about Hillary Clinton. It was never my intention to have that." She initially denied the allegation that she was or is connected to the Russian government. At a later date she disclosed that she was in regular contact with the Russian Prosecutor General's office and with Prosecutor General Yury Chaika, about sharing information she acquired in her investigation relating to the Magnitsky Act. On July 14, Akhmetshin stated in an interview that Veselnitskaya had claimed to have evidence of "violations of Russian law by a Democratic donor", and added that she "described her findings at the meeting and left a document about them with Trump Jr. and the others." The meeting, which took place on June 9, 2016, first came to the attention of authorities in April 2017, when Kushner reported on a revised security clearance form that he had met with Veselnitskaya. On July 8, 2017, The New York Times first mentioned a June 2016 meeting with "a Russian lawyer who has connections to the Kremlin", arranged by Trump Jr. and including Kushner and Manafort. Later that day, Trump Jr. released a statement calling it a "short introductory meeting" about American adoption of Russian children and "not a campaign issue". The next day it emerged that Goldstone had told Trump Jr. that the meeting would provide the Trump campaign with negative information about Clinton, and that this offer was "part of Russia and its government's support for Mr. Trump", without mentioning adoptions or the Magnitsky Act. Trump Jr. reacted by acknowledging that he had been expecting information about Clinton. Over the next few days the identity of the attendees was established. On July 11 Trump Jr. tweeted the entire email chain leading up to the meeting, a few minutes before The New York Times published it as well. Trump Jr. stated that he would have preferred to just have a phone call but that didn't work out. He told Sean Hannity that the meeting had been fully arranged by email, and that he had received no further details by phone. He would later contradict this statement during a closed-door interview with the Senate Judiciary Committee on September 7, acknowledging three short phone calls with Agalarov prior to the meeting. On July 12, 2017, President Trump stated in a Reuters interview that he had only known about the meeting for a couple of days, and that "many people would have held that meeting". Trump praised his son Don Jr. for his transparency in releasing the emails, and claimed that they were victims of a "political witch hunt". The same day Trump Jr. denied having told his father about the meeting. On July 13, Corey Lewandowski was asked on NBC's Meet the Press why he had not been invited to the meeting. He replied that he was at a Trump rally in Florida on the meeting date, but there was in fact no rally in Florida that day. Instead, Trump attended a Trump Victory fundraising lunch at the Four Seasons Hotel in New York, and returned to Trump Tower at 1:02 PM, where he "remained for the rest of the afternoon". According to emails, the Veselnitskaya meeting was scheduled for 4:00 PM. The July 8 statement by Trump Jr. became controversial in its own right because of conflicting stories about who had written it. On July 11 it was reported that the statement had been drafted by presidential advisers aboard Air Force One on the way home from the G20 summit in Germany, and that it had been approved by President Trump. On July 12 Trump's lawyer Jay Sekulow insisted that it had been written by Trump Jr. in consultation with his lawyer, and that Donald Trump "wasn't involved in that". He repeated these statements on July 16. On July 31 The Washington Post reported that Trump had indeed personally dictated, worked on, and released the statement in Trump Jr's name, with claims that "were later shown to be misleading". According to The Post, Trump had "overruled the consensus" of Trump Jr., Kushner, aides, and lawyers, who favored issuing a transparent account "because they believed the complete story would eventually emerge." Some advisors reportedly feared "that the president’s direct involvement leaves him needlessly vulnerable to allegations of a coverup." The next day, White House Press Secretary Sarah Huckabee Sanders stated that Trump "certainly didn't dictate, but ... he weighed in, offered suggestions, like any father would do". In January 2018, in a confidential letter from Trump's legal team to special counsel Robert Mueller, Trump's lawyers acknowledged for the first time that Trump had in fact dictated the first statement put out about the meeting in Trump Jr.'s name, thus contradicting prior representations. Although Goldstone's emails described Veselnitskaya as a "Russian government attorney", Scott Balber, formerly a lawyer for Trump and now for Agalarov, said in a July 14, 2017 interview that she had no association with the Russian government. For his part, Akhmetshin denied having ties to Russian intelligence, and said that the efforts by Veselnitskaya and himself "were not coordinated with the Russian government." Kremlin spokesman Dmitry Peskov said the government didn't know Akhmetshin or Veselnitskaya, or anything about the meeting. In a November 2017 statement to the Senate Judiciary Committee, Veselnitskaya said "I have no relationship with Mr. Chaika, his representatives and his institutions other than those related to my professional functions as a lawyer." However she also stated in April 2018: “I am a lawyer, and I am an informant,” adding that "since 2013, I have been actively communicating with the office of the Russian prosecutor general," Yury Chaika. CNN reported on October 9 that Balber had obtained the memo which Veselnitskaya took to the meeting, and it was released by Foreign Policy. It should be noted, though, that Veselnitskaya was Balber's only source for the document, as well as the only source of the claim that this is the same document that was brought to the Trump Tower meeting; this matters because Veselnitskaya has elsewhere been indicted on charges of falsifying the origin of another document which she helped draft and release to US investigators in a separate investigation which is also related to William Browder and the Magnitsky Act. The memo released by Veselnitskaya claimed that an American firm, Ziff Brothers Investments, illegally evaded tens of millions of dollars in Russian taxes, and contributed to Clinton's election campaign. Veselnitskaya reportedly coordinated this accusation in advance with Chaika, and Putin later repeated the charge. Two previously undisclosed emails from Rob Goldstone emerged on December 7, as discovered by congressional investigators. The recipients included Trump Jr., Kushner, and Manafort. In a June 14, 2016 email, five days after the meeting, Goldstone forwarded a news story about Russian hacking of Democrats' emails, describing the news as "eerily weird" in light of what had been discussed at Trump Tower. This discovery contradicted the initial statement by Trump Jr. that "there was no follow up" after the meeting, as well as his September 2017 testimony to the Senate Judiciary Committee in which he stated: "Rob, Emin and I never discussed the meeting again". On May 16, 2018, the Senate Judiciary Committee released emails and text messages in which Trump attorney Alan S. Futerfas provided a prepared statement for Goldstone, Agalarov and Kaveladze, further asserting that it "would be our preference" if they did not say anything else in response to inquiries about the meeting. Michael Cohen asserted in July 2018 that the president knew of the Tower meeting in advance. Democratic Representatives Brad Sherman and Al Green sponsored a resolution to impeach President Trump. Sherman argued that Trump Jr.'s emails "add credibility" to the theory that Trump dismissed James Comey as Director of the Federal Bureau of Investigation as an attempt to derail the ongoing investigation. On July 10, 2017, the Vice Chairman of the Senate Intelligence Committee, Democratic Senator Mark Warner, stated that "This is the first time that the public has seen clear evidence of senior level members of the Trump campaign meeting Russians to try to obtain information that might hurt the campaign of Hillary Clinton". Warner also stated that the incident was part of a "continuing pattern" in which Trump officials and members of the Trump campaign have "conveniently forgotten meetings with Russians only when they are then presented with evidence, they have to recant and acknowledge those kind of meetings". Another member of the committee, the Republican Susan Collins, stated that Donald Trump Jr. and others who attended the meeting should testify before the committee. Representative Adam Schiff, the top Democrat on the House Intelligence Committee, described the matter as "a very serious development", and that "It all warrants thorough investigation. Everyone who was in that meeting ought to come before our committee." Republicans in Congress have been for the most part muted with their comments about the event. On July 10, 2017, Representative Ted Yoho (R-FL) when asked in an interview if he thought it was appropriate for Trump Jr. to take a meeting with a Russian national, responded that he "probably would have done the same thing” calling it “opposition research". On July 11, 2017, Representative Marsha Blackburn (R-TN) suggested that "the president’s son may have been “duped” into attending the meeting". The meeting was regarded by some commentators as evidence of attempted collusion between the Trump campaign and Russia. A statement issued by Mark Corallo, former spokesperson for Trump's legal team, suggested that the meeting was a "setup" and that Veselnitskaya and her translator had “misrepresented who they were”. He implied that the Russian lawyer was connected to the Clintons through British ex-spy Christopher Steele. The Senate Intelligence Committee held a private hearing with Kushner on July 24. In the meeting he responded to questions by the Committee about his contacts with Russian officials and insisted that he had not colluded with foreign agents. He publicly released an 11-page written statement detailing four meetings he had with Russian officials during the campaign and transition periods, including the Trump Tower meeting. He said he had not known all the details about that meeting because he did not read all of the email chain that Trump Jr. had forwarded to him. The Intelligence Committee also met privately with Manafort on July 25. The Committee on the Judiciary scheduled a hearing on July 26 on the subject "Oversight of the Foreign Agents Registration Act and Attempts to Influence U.S. Elections: Lessons Learned from Current and Prior Administrations". Trump Jr. and Manafort were originally scheduled to testify at that hearing, but each negotiated to meet privately with the committee on July 25 instead. They have also arranged to turn over requested documents to the committee. Among the documents Manafort turned over to congressional investigators were notes he took during the June 2016 meeting. Manafort and Trump Jr. are expected to testify in public eventually. William Browder testified before the Committee on the Judiciary on July 27, claiming that Veselnitskaya was representing the Kremlin's interests in the meeting, which was arranged for persuading the future lifting of the Magnistky Act. On September 7, 2017, Donald Trump Jr. testified privately under questioning from Senate Judiciary Committee staffers. The New York Times reported that in his testimony, Trump Jr. acknowledged he had indeed sought the meeting in the hopes to obtain information about Clinton's "fitness". Sometime in the summer of 2017, I read all over the media that there had been a meeting in Trump Tower in June 2016 involving Don Jr. and others from the campaign with Russians, including a representative of the Russian government, and an email setting up the meeting with the subject line, "Dirt on Hillary Clinton." Something clicked in my mind. I remember being in the room with Mr. Trump, probably in early June 2016, when something peculiar happened. Don Jr. came into the room and walked behind his father's desk – which in itself was unusual. People didn't just walk behind Mr. Trump's desk to talk to him. I recalled Don Jr. leaning over to his father and speaking in a low voice, which I could clearly hear, and saying: "The meeting is all set." I remember Mr. Trump saying, "Ok good…let me know." What struck me as I looked back and thought about that exchange between Don Jr. and his father was, first, that Mr. Trump had frequently told me and others that his son Don Jr. had the worst judgment of anyone in the world. And also, that Don Jr. would never set up any meeting of any significance alone – and certainly not without checking with his father. I also knew that nothing went on in Trump world, especially the campaign, without Mr. Trump's knowledge and approval. So, I concluded that Don Jr. was referring to that June 2016 Trump Tower meeting about dirt on Hillary with the Russian representative when he walked behind his dad's desk that day -- and that Mr. Trump knew that was the meeting Don Jr. was talking about when he said, "That's good…let me know." As of July 2017, Robert Mueller, the special counsel of the Department of Justice in charge of Russia-related investigations, was looking into the Trump Tower meeting. The inquiry was confirmed by Kaveladze's attorney, who said special counsel investigators are seeking information from his client. On July 21, 2017, Mueller asked the White House to preserve all documents related to the Russian meeting in June 2016. By August 3, 2017, Mueller had impaneled a grand jury in the District of Columbia that issued subpoenas concerning the meeting. In April 2018, Mueller filed documents with the court that stated that the intended purpose of the raid on Manafort's home in July 2017 was to seek documents related to the Trump Tower meeting. In August 2016, Donald Trump Jr. had a meeting with an emissary representing Saudi Arabia's Crown Prince Mohammad bin Salman and Mohammed bin Zayed Al Nahyan, the de facto ruler of the United Arab Emirates. The envoy offered help to the Trump presidential campaign. The meeting included Lebanese-American businessman George Nader, Joel Zamel, an Israeli specialist in social media manipulation, and American businessman Erik Prince. George Papadopoulos joined Donald Trump's presidential campaign in early March 2016 as a foreign policy advisor. Within two weeks he was approached by a London-based professor with Russian connections, later identified as Joseph Mifsud. Mifsud told him that during a recent trip to Russia, he had learned that the Russians were in possession of thousands of stolen emails that were politically damaging to Hillary Clinton. This occurred before there was public knowledge of the hack of Democratic National Committee computers and of John Podesta's emails, both of which U.S. intelligence agencies believe were carried out by Russia. Papadopoulos sent emails concerning Vladimir Putin to at least seven campaign officials. Trump national campaign co-chairman Sam Clovis encouraged Papadopoulos to fly to Russia to meet with agents of the Russian Foreign Ministry, after being told that Russia had "dirt" on Hillary Clinton it wanted to share with Trump's campaign. Between March and September 2016, Papadopoulos made at least six requests for Trump or representatives of his campaign to meet in Russia with Russian politicians. In May, campaign chairman Paul Manafort forwarded one such request to his deputy Rick Gates, saying "We need someone to communicate that (Trump) is not doing these trips. It should be someone low-level in the campaign so as not to send any signal." Gates delegated the task to the campaign's correspondence coordinator, referring to him as "the person responding to all mail of non-importance". In May 2016, Papadopoulos reportedly revealed Russia's possession of Clinton-related emails at a chance “romantic encounter” with a woman who knew the top Australian diplomat to the United Kingdom, Alexander Downer. Papadopoulos later passed on the tip to him. Over a large quantity of wine, Papadopoulos reportedly confirmed to Downer the existence of these emails. After the DNC emails stolen by Russia were published by Wikileaks as an intermediary on July 22, 2016, Australian officials relayed Papadopoulos' statements to American officials. The revelation of Papadopoulos' inside information about Russia's stolen DNC emails was a driving factor in the FBI opening an investigation into the Russian interference in the 2016 United States elections in July 2016. Papadopoulos was arrested at Washington Dulles Airport on July 27, 2017, and he has since been cooperating with Special Counsel Robert Mueller in his investigation. On October 5, 2017, Papadopoulos pleaded guilty in the U.S. District Court for the District of Columbia to making false statements to FBI agents relating to contacts he had with agents of the Russian government while working for the Trump campaign. 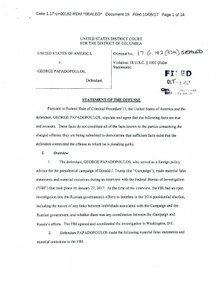 Papadopoulos's arrest and guilty plea became public on October 30, 2017, when court documents showing the guilty plea were unsealed. Carter Page served as a foreign policy adviser in Donald Trump's 2016 Presidential campaign. On November 2, 2017, Page testified to the House Intelligence Committee that he had informed Jeff Sessions, Corey Lewandowski, Hope Hicks and other Trump campaign officials that he was traveling to Russia to give a speech in July 2016, and Corey Lewandowski approved the trip. Page testified that he met with Russian government officials during this trip and had sent a post-meeting report via email to members of the Trump campaign. He also indicated that campaign co-chairman Sam Clovis had asked him to sign a non-disclosure agreement about his trip. Elements of Page's testimony contradicted prior claims by Trump, Sessions, and others in the Trump administration. Lewandowski, who had previously denied knowing Page or meeting him during the campaign, said after Page's testimony that his memory was refreshed and acknowledged that he had been aware of Page's trip to Russia. Page also testified that after delivering a commencement speech at the New Economic School in Moscow, he spoke briefly with one of the people in attendance, Arkady Dvorkovich, a Deputy Prime Minister in Dmitry Medvedev's cabinet, contradicting his previous statements not to have spoken to anyone connected with the Russian government. The Steele Dossier alleges that Igor Sechin, the president of state-run Russian oil conglomerate Rosneft, offered Page the brokerage of up to 19 percent of Rosneft if Trump worked to roll back the Magnitsky Act economic sanctions that had been imposed on Russia in 2012. It also alleges that Page confirmed, on Trump's "full authority", that this was Trump's intent. Page denied meeting with Sechin, but did acknowledge meeting with Andrey Baranov, Rosneft's head of investor relations. Carter said that he did not "directly" express support for lifting the sanctions during the meeting with Baranov, but that he might have mentioned the proposed Rosneft transaction. Eleven days before Donald Trump's presidential inauguration, Trump's personal lawyer and fixer Michael Cohen met with Russian oligarch Viktor Vekselberg and Andrew Intrater, founder and CEO of Columbus Nova, who invests money for Mr. Vekselberg, in Mr. Cohen's office on the 26th floor of Trump Tower. Days after the inauguration, Columbus Nova awarded Mr. Cohen a $1 million consulting contract, a deal that has drawn the attention of federal authorities investigating Mr. Cohen. ^ Crown prosecutor is not an office that exists in Russia; Goldstone is likely referring to the Prosecutor General of Russia here. The position has been held by Yury Chaika since 2006. ^ a b "Donald Trump Jr.'s Emails About Meeting With Russian Lawyer, Annotated". NPR. July 11, 2017. Retrieved July 12, 2017. ^ a b c d e f Becker, Jo; Apuzzo, Matt; Goldman, Adam (July 8, 2017). "Trump Team Met With Lawyer Linked to Kremlin During Campaign". The New York Times. Retrieved July 12, 2017. ^ "What We Know About the Controversial 2016 Trump Tower Meeting With Russian Officials". Time. ^ a b Apuzzo, Matt; Becker, Jo; Goldman, Adam; Haberman, Maggie (July 10, 2017). "Trump Jr. Was Told in Email of Russian Effort to Aid Campaign". The New York Times. Retrieved July 12, 2017. ^ Stelter, Brian (July 11, 2017). "New York Times story triggered the release of Trump Jr. emails". CNNMoney. ^ Becker, Jo; Goldman, Adam; Apuzzo, Matt (July 11, 2017). "Russian Dirt on Clinton? 'I Love It,' Donald Trump Jr. said". The New York Times. Retrieved July 12, 2017. ^ "Trump dictated son's misleading statement on meeting with Russian lawyer: Sources". ABC News. August 1, 2017. ^ Cohen, Marshall (June 2, 2018). "Trump lawyers say he 'dictated' statement on Trump Tower meeting, contradicting past denials". CNN. Retrieved August 29, 2018. ^ "Trump denies knowing of 2016 Trump Tower meeting with Russians". July 27, 2018 – via www.reuters.com. ^ a b Prokupecz, Shimon; Perez, Evan; Brown, Pamela (July 11, 2017). "Source: Justice Dept. probe will look at Trump Jr.'s disclosed emails, meeting". CNN. Retrieved July 12, 2017. ^ a b CNN, Jeremy Herb and Marshall Cohen,. "Who is George Papadopoulos?". CNN. Retrieved October 31, 2017. ^ Ford, Matt (July 9, 2017). "Why Did Donald Trump Jr. Meet With A Russian Lawyer Promising Information?". The Atlantic. Retrieved July 14, 2017. ^ Edelman, Adam (July 11, 2017). "Rob Goldstone: The Russia-Tied Music Publicist Behind Trump Jr. Meeting". NBC News. Retrieved July 14, 2017. ^ Porter, Tom (July 11, 2017). "Trump, the Russian Lawyer and the Pop Star: President's Links to Azerbaijan Oligarch Come Under Scrutiny". Newsweek. Retrieved July 14, 2017. ^ "How a Music Publicist Connected Trump's Inner Circle to a Russian Lawyer Peddling Clinton Dirt". Mother Jones. July 10, 2017. Retrieved July 11, 2017. ^ Twohey, Megan; Eder, Steve (July 10, 2017). "How a Pageant Led to a Trump Son's Meeting With a Russian Lawyer". The New York Times. Retrieved July 12, 2017. ^ Bondarenko, Veronika (July 11, 2017). "Donald Trump Jr.'s emails reference meeting the crown prosecutor of Russia – here's what that might be". Business Insider. Axel Springer SE. Retrieved July 12, 2017. ^ Ioffe, Julia (July 11, 2017). "What the Heck Is a Russian 'Crown Prosecutor'?". The Atlantic. ^ a b c d e f g h i j Alvarez, Priscilla; Godfrey, Elaine (July 11, 2017). "Donald Trump Jr.'s Email Exchange With Rob Goldstone". The Atlantic. Retrieved August 5, 2017. ^ Parks, Miles (July 10, 2017). "Lawyer Who Met With Trump Jr. Has Ties To Russian Government". NPR. Retrieved July 17, 2017. ^ a b c d Kramer, Andrew; LaFraniere, Sharon (April 27, 2018). "Lawyer Who Was Said to Have Dirt on Clinton Had Closer Ties to Kremlin Than She Let On". New York Times. Retrieved May 2, 2018. ^ a b "Trump Tower Russia meeting: At least eight people in the room". CNN. July 15, 2017. ^ a b Bertrand, Natasha (August 31, 2017). "Manafort's notes from the Trump Tower Russia meeting reportedly mention political contributions and the RNC". Yahoo Finance. Retrieved September 1, 2017. ^ Fox, Emily Jane (October 27, 2016). "Was Donald Trump's son-in-law the evil genius all along? ", Vanity Fair. ^ Relman, Eliza; Bertrand, Natasha (July 14, 2017). "Paul Manafort was in the Russian lawyer meeting with Jared Kushner and Donald Trump Jr. — here's what you need to know about him". Business Insider. Retrieved July 18, 2017. ^ Betsy Klein. "Donald Trump Jr. says he misses campaign trail". CNN. Retrieved May 16, 2017. ^ Horowitz, Jason (September 20, 2016). "Donald Trump Jr.'s Skittles Tweet Fits a Pattern". The New York Times. ISSN 0362-4331. Retrieved May 26, 2017. ^ Jason Motlagh (December 31, 2015). "Fighting Putin Doesn't Make You a Saint". The New Republic. Retrieved July 15, 2017. ^ MacFarquhar, Neil; Kramer, Neil (July 11, 2017). "Natalia Veselnitskaya, Lawyer Who Met Trump Jr., Seen As Fearsome Moscow Insider". The New York Times. Retrieved July 15, 2017. ^ Dilanian, Ken (November 10, 2017). "Trump Dossier Firm Also Supplied Info Used in Meeting of Russians, Trump Team". NBC News. Retrieved June 10, 2018. ^ a b Dilanian, Ken; Lebedeva, Natasha; Jackson, Hallie (July 14, 2017). "Former Soviet Counterintelligence Officer at Meeting With Donald Trump Jr. and Russian Lawyer". NBC News. Retrieved July 19, 2017. ^ Quigley, Aiden (July 14, 2017). "Who Is Rinat Akhmetshin, Former Soviet Intelligence Officer In Donald Trump Jr. Meeting?". Newsweek. Retrieved July 19, 2017. ^ a b c Helderman, Rosalind S.; Hamburger, Tom; Crites, Alice (July 14, 2017). "Russian-American Lobbyist Was Present At Trump Jr.'s Meeting With Kremlin-Connected Lawyer". Chicago Tribune. Retrieved July 15, 2017. ^ Cloud, David S.; Tanfani, Joseph (July 14, 2017). "Soviet Army intelligence veteran attended meeting with Donald Trump Jr. and Russian lawyer". Los Angeles Times. ^ LaFraniere, Sharon; Kirkpatrick, David D.; Vogel, Kenneth P. (August 21, 2017). "Lobbyist at Trump Campaign Meeting Has a Web of Russian Connections". ^ "Pattern Of Hacking Preceded Attendee Of Donald Trump's Camp Russia Meeting". The Rachel Maddow Show. August 24, 2017 – via YouTube. ^ Boburg, Shawn; Gillum, Jack (July 15, 2017). "Who Is Rob Goldstone, Whose Email To Trump Jr. On Russia Caused A Sensation?". The Washington Post. Retrieved July 16, 2017. ^ "Translator in Trump Jr. meeting identified as ex-State Dept. contractor". CBS News. Retrieved July 16, 2017. ^ a b Brown, Pamela (July 18, 2017). "8th person at Trump Tower meeting identified". CNN. Retrieved July 18, 2017. ^ LaFraniere, Sharon; Goldman, Adam (July 18, 2017). "Guest List at Donald Trump Jr.'s Meeting With Russian Expands Again". The New York Times. Retrieved July 18, 2017. ^ a b c Becker, Jo; Apuzzo, Matt; Goldman, Adam (July 9, 2017). "Trump's Son Met With Russian Lawyer After Being Promised Damaging Information on Clinton". The New York Times. Retrieved July 12, 2017. ^ Diamond, Jeremy (July 16, 2017). "The ever-changing story about Trump Jr.'s meeting -- what we know". CNN. Retrieved July 17, 2017. ^ a b Borchers, Callum (July 9, 2017). "Donald Trump Jr.'s stunning admission to the New York Times". The Washington Post. Retrieved July 12, 2017. ^ Sink, Justin (July 11, 2017). "Here Are Trump Jr.'s Shifting Explanations for His Russia Meeting". Bloomberg. Retrieved July 17, 2017. ^ Wilts, Alexandra (July 10, 2017). "What happened between Donald Trump Jr and the Russian lawyer? Everything we know so far". The Independent. Retrieved July 17, 2017. ^ Stelter, Brian (July 11, 2017). "New York Times story triggered the release of Trump Jr. emails". CNN. Retrieved August 7, 2017. ^ a b "Trump Jr 'denies telling father about Russian lawyer meeting'". BBC News. July 12, 2017. Retrieved July 16, 2017. ^ a b Max, Greenwood (July 14, 2017). "Russian lawyer who met with Trump Jr. was in touch with top Russian prosecutor". The Hill. ^ a b Simons, Keir; Elbaum, Rachel; Rafferty, Andrew (July 11, 2017). "Russian Lawyer Veselnitskaya Says She Didn't Give Trump Jr. Info on Clinton". MSNBC. Retrieved July 16, 2017. ^ Forrest, Brett; Sonne, Paul (July 15, 2017). "Russian Lawyer Whom Trump Jr. Met Says She Was in Contact With Top Russian Prosecutor". The Wall Street Journal. ^ Neuhauser, Alan (July 14, 2017). "Report: Documents Were Exchanged in Donald Trump Jr.'s Russia Meeting". US News. Retrieved July 19, 2017. ^ Becker, Jo (July 11, 2017). "Donald Trump Jr. and Russia: How The Times Connected the Dots". The New York Times. Retrieved July 18, 2017. ^ a b Donald Trump Jr. [@DonaldJTrumpJr] (July 11, 2017). "Here's my statement and the full email chain" (Tweet) – via Twitter. ^ Grynbaum, Michael M. (July 11, 2017). "How Trump Jr.'s 'Transparency' Erodes Trust With the Media". The New York Times. ^ "Donald Trump Jr. on 'Hannity': In retrospect, I would've done things differently". Fox News Channel. July 11, 2017. Retrieved September 8, 2017. ^ "Trump Jr. says he can't recall White House role in explaining meeting with Russians". The Washington Post. July 11, 2017. Retrieved September 7, 2017. ^ "Exclusive: Trump says he does not fault son for meeting Russian lawyer". Reuters. July 13, 2017. Retrieved July 15, 2017. ^ Balluck, Kyle (July 12, 2017). "Trump:Furor Over Son's Russia Meeting 'The Greatest Witch Hunt In Political History'". The Hill. Retrieved July 20, 2017. ^ Derespina, Cody (July 12, 2017). "Trump Tweets Defense Of Donald Trump Jr., Blasts 'Fake Media'". Fox News. Retrieved July 20, 2017. ^ Kruzel, John (July 14, 2017). "Lewandowski wrong, Trump was in NY on day of Russia meeting". PolitiFact. Retrieved August 29, 2017. ^ Merica, Dan (July 12, 2017). "Recreating June 9: A very consequential day in the 2016 campaign". CNN. Retrieved August 29, 2017. ^ Bowden, John (July 11, 2017). "Trump signed off on Trump Jr.'s first statement on Russia meeting: report". The Hill. Retrieved July 18, 2017. ^ a b c Parker, Ashley; Leonnig, Carol D.; Rucker, Philip; Hamburger, Tom (July 31, 2017). "Trump dictated son's misleading statement on meeting with Russian lawyer". The Washington Post. Retrieved August 1, 2017. ^ Wright, David (July 12, 2017). "Trump lawyer: President was aware of 'nothing'". CNN. Retrieved June 5, 2018. ^ a b Dolak, Kevin; Faulders, Katherine (July 31, 2017). "Trump dictated son's misleading statement on meeting with Russian lawyer: Sources". ABC News. Retrieved June 5, 2018. ^ Todd, Chuck (July 16, 2017). "Meet the Press - July 16, 2017". NBC News. Retrieved June 5, 2018. ^ "Trump 'dictated' son's statement on Russian lawyer meeting". BBC News. August 1, 2017. Retrieved August 1, 2017. ^ Nelson, Louis (August 1, 2017). "Sanders: Trump 'weighed in' on initial statement about son's Russia meeting". Politico. Retrieved August 1, 2017. ^ Cohen, Marshall (June 2, 2018). "Trump lawyers say he 'dictated' statement on Trump Tower meeting, contradicting past denials". CNN. Retrieved June 3, 2018. ^ "Attorney For Emin And Aras Agalarov Speaks Out". CNN. July 14, 2017. Retrieved July 14, 2017. ^ Ayers, Sabra (July 12, 2017). "Kremlin Says The Trump Jr. Email Story Is Like A Plot In A Dragging Soap Opera". Los Angeles Times. Retrieved July 15, 2017. ^ Tucker, Eric; Braun, Stephen (July 15, 2017). "Russian-American At Trump Jr. Meeting Is Ex-Military Officer". Associated Press. ^ a b Brown, Pamela; Herb, Jeremy (October 9, 2017). "Russians' lawyer says new documents show Trump Tower meeting not about dirt on Clinton". CNN. Retrieved October 17, 2017. ^ Groll, Elias (October 16, 2017). "Here's the Memo the Kremlin-Linked Lawyer Took to the Meeting With Donald Trump Jr". Foreign Policy. Retrieved October 17, 2017. ^ Barrett, Devlin; Zapotosky, Matt (January 8, 2019). "Russian lawyer at Trump Tower meeting charged in separate case". Washington Post. Retrieved February 6, 2019. ^ LaFraniere, Sharon; Kramer, Andrew E. (October 27, 2017). "Talking Points Brought to Trump Tower Meeting Were Shared With Kremlin". The New York Times. ^ a b Sciutto, Jim; Raju, Manu; Herb, Jeremy (December 7, 2017). "Exclusive: Previously undisclosed emails show follow-up after Trump Tower meeting". CNN. Retrieved December 8, 2017. ^ "Goldstone Exhibits, Senate Judiciary Committee". Senate Judiciary Committee. December 15, 2017. ^ Swaine, Jon; Roth, Andrew (May 16, 2018). "Trump attorney fed statement to publicist for Russians about Trump Tower meeting". The Guardian. Retrieved May 16, 2018. ^ a b CNN, Jim Sciutto, Carl Bernstein and Marshall Cohen. "Cohen claims Trump knew in advance of 2016 Trump Tower meeting". CNN. ^ DeBonis, Mike (July 12, 2017). "A House Democrat has filed the first articles of impeachment against President Trump". The Washington Post. Retrieved July 13, 2017. ^ Grieve, Pete (July 11, 2017). "Warner: 'Clear evidence' that Trump officials met Russians to get info". CNN. Retrieved July 12, 2017. ^ "Donald Jr's meeting with Russians is "clear evidence" of campaign workings". Reuters. July 10, 2017. Retrieved July 12, 2017. ^ a b Freifeld, Karen (July 10, 2017). "Trump Jr. was told of Russian effort to help father's campaign: NY Times". Reuters. Retrieved July 12, 2017. ^ a b c Bacon, Perry Jr. (July 12, 2017). "Republicans Matter Most, And They Don't Seem To Care Much About Trump Jr". FiveThirtyEight. Retrieved July 20, 2017. ^ Grieve, Pete (July 10, 2017). "Yoho: Trump Jr.'s Russian Lawyer Meeting 'opposition research'". CNN. Retrieved July 20, 2017. ^ "Rep. Marsha Blackburn: Russia Is Not Our Friend". Fox News Channel. July 11, 2017. Retrieved July 20, 2017. ^ French, David (July 11, 2017). "There Is Now Evidence That Senior Trump Officials Attempted to Collude With Russia". National Review. Retrieved July 12, 2017. ^ Krauthammer, Charles (July 13, 2017). "Bungled collusion is still collusion". The Washington Post. Retrieved July 15, 2017. ^ Kludt, Tom (July 14, 2017). "Krauthammer calls it 'collusion'". CNNMoney. Retrieved July 15, 2017. ^ Thompson, Isobel (July 10, 2017). "Trump Jr.'s Response to Offer for Russian Info on Clinton? "I Love It"". Vanity Fair. Retrieved July 24, 2017. ^ Rucker, Philip; Demirjian, Karoun (July 24, 2017). "Kushner Questioned By Senate Investigators On Russia". The Washington Post. ^ a b Kinery, Emma (July 24, 2017). "Get ready: Jared Kushner, Donald Trump Jr., Manafort head to Senate". USA Today. Retrieved August 5, 2017. ^ Perez, Evan; Raju, Manu (July 25, 2017). "Manafort subpoenaed by judiciary panel, met with Senate intel". CNN. Retrieved July 25, 2017. ^ Helderman, Rosalind S.; Demirjian, Karoun (July 25, 2017). "s Manafort testifies to Senate Intelligence Committee, turns over notes from Trump Tower meeting with Russian lawyer". The Washington Post. Retrieved August 9, 2017. ^ Leonnig, Carol D.; Hamburger, Tom; Helderman, Rosalind S. (August 9, 2017). "FBI conducted predawn raid of former Trump campaign chairman Manafort's home". The Washington Post. Retrieved August 9, 2017. ^ Tillett, Emily (July 27, 2017). "Trump Jr.'s meeting with Russian lawyer was about sanctions, financier tells Senate panel". CBS News. Retrieved July 27, 2017. ^ NICHOLAS FANDOS and MAGGIE HABERMAN (September 7, 2017). "Trump Jr. Says He Wanted Russian Dirt to Determine Clinton's 'Fitness' for Office - The New York Times". Nytimes.com. Retrieved January 6, 2018. ^ Meredith, Sam (February 27, 2019). "Michael Cohen: Read the statement about Donald Trump here". www.cnbc.com. ^ Bash, Dana. "Exclusive: Mueller asks WH staff to preserve all documents relating to June 2016 meeting" (July 21, 2017). CNN. Retrieved July 21, 2017. ^ Freifeld, Karen; Walcott, John (August 3, 2017). "Grand jury issues subpoenas in connection with Trump Jr., Russian lawyer meeting: sources". Reuters. Retrieved August 4, 2017. ^ Croucher, Shane (April 24, 2018). "FBI Raided Manafort Over Records of Trump Tower Meeting With Russians, Mueller Confirms". Newsweek. Retrieved April 24, 2018. ^ a b "Trump Jr. and Other Aides Met With Gulf Emissary Offering Help to Win Election". The New York Times. May 19, 2018. ^ "Trump Jr. met Gulf princes' emissary in 2016 who offered campaign help". Reuters. May 19, 2018. ^ Sommer, Allison Kaplan (May 21, 2018). "Who Is Joel Zamel, the Australian-Israeli Linked to Mueller's Trump Probe?". Haaretz. Retrieved June 10, 2018. ^ "The Australian caught up in Mueller's US election probe". SBS News. Retrieved June 10, 2018. ^ Ryan, Missy; Mufson, Steven (March 22, 2016). "One of Trump's foreign policy advisers is a 2009 college grad who lists Model UN as a credential". The Washington Post. Retrieved August 15, 2017. ^ Kutner, Max (October 31, 2017). "Who is Joseph Mifsud, the professor in the George Papadopoulos investigation?". Newsweek. Retrieved October 31, 2017. ^ Meg Kelly (November 13, 2017). "All the known times the Trump campaign met with Russians". WashingtonPost.com. Retrieved November 26, 2017. ^ "How the Russia Inquiry Began: A Campaign Aide, Drinks and Talk of Political Dirt". The New York Times. December 30, 2017. ^ Helderman, Rosalind S.; Hamburger, Tom (October 30, 2017). "Top campaign officials knew of Trump adviser's outreach to Russia". The Washington Post. Retrieved October 30, 2017. ^ LaFraniere, Sharon; Kirkpatrick, David; Schwirtz, Michael; Higgins, Andrew; Magra, Iliana; Apuzzo, Matt. "'A London Meeting of an Unlikely Group: How a Trump Adviser Came to Learn of Clinton 'Dirt". The New York Times. Retrieved December 5, 2017. ^ Steve, Reilly. "Who is George Papadopoulos?". USA Today. Retrieved December 5, 2017. ^ a b Tom Winter and Tracy Connor (October 30, 2017). "Secret Guilty Plea of Ex-Trump Campaign Adviser George Papadopoulos Reveals Russian Ties". NBC News. Retrieved October 30, 2017. ^ a b Apuzzo, Matt; Schmidt, Michael S. (October 30, 2017). "Trump Campaign Adviser Met With Russian to Discuss 'Dirt' on Clinton". New York Times. ^ Hamburger, Tom; Leonnig, Carol D.; Helderman, Rosalind S. (August 14, 2017). "Trump campaign emails show aide's repeated efforts to set up Russia meetings". The Washington Post. Retrieved August 15, 2017. ^ Brennan, Christopher (August 14, 2017). "Trump campaign adviser made repeated attempts to set up meeting with Russia: report". Daily News. New York. Retrieved August 15, 2017. ^ Wroe, David (January 5, 2018). "The 'romantic encounter' that set off Australia's role in triggering Trump investigation". The Age. Retrieved January 6, 2018. ^ LaFraniere, Sharon; Mazzetti, Mark; Apuzzo, Matt (December 30, 2017). "How the Russia Inquiry Began: A Campaign Aide, Drinks and Talk of Political Dirt". The New York Times. Retrieved January 3, 2018. ^ "Plea Offer and Defendant's Acceptance". United States v. George Papadopoulos. United States Department of Justice. October 5, 2017. ^ "Statement of Facts of Guilt". United States v. George Papadopoulos. United States Department of Justice. October 5, 2017. ^ Joseph Tanfani, Former Trump campaign aide George Papadopoulos pleads guilty to lying to the FBI agents in Mueller probe, Los Angeles Times (October 30, 2017). ^ Mider, Zachary (March 30, 2016). "Trump's New Russia Adviser Has Deep Ties to Kremlin's Gazprom: Carter Page brings a "real-world" resume—and says his close relations with Russian business are a strength". Bloomberg News. New York, NY. ^ "Testimony of Carter Page, U.S. House Select Committee on Intelligence, Nov. 7, 2017" (PDF). ^ a b Raju, Manu; Herb, Jeremy (November 2, 2017). "Carter Page testifies he told Sessions about Russia trip". CNN.com. Atlanta, GA.
^ Price, Greg (November 7, 2017). "Carter Page Says Russia Trip was Approved by Trump Campaign Manager Lewandowski". Newsweek. New York, NY. ^ Correll, Diana Stancy (November 6, 2017). "Corey Lewandowski and Hope Hicks knew about Carter Page's trip to Russia". The Washington Examiner. Washington, D.C.
^ a b Mazzetti, Mark; Goldman, Adam (November 3, 2017). "Trump Campaign Adviser Met With Russian Officials in 2016". New York Times. New York, NY. ^ Raju, Manu; Herb, Jeremy; Polantz, Katelyn (November 8, 2017). "Carter Page reveals new contacts with Trump campaign, Russians". CNN.com. Atlanta, GA.
^ "Ex-Trump adviser Carter Page contradicts Sessions in testimony about Russia trip". Fox News. New York, NY. November 3, 2017. ^ Tacopino, Joe (November 2, 2017). "Carter Page: I told Jeff Sessions about my trip to Russia". New York Post. New York, NY. ^ Lima, Cristiano (November 8, 2017). "Lewandowski: 'My memory has been refreshed' on Carter Page Moscow trip". Politico. Washington, D.C.
^ a b c d Tracy, Abigail (November 7, 2017). "Is Carter Page Digging the Trump Administration's Grave?". Vanity Fair. Retrieved November 7, 2017. ^ Shepherd, Todd. "Carter Page: Committees have 'completely blocked' me from testifying". The Washington Examiner. Retrieved December 1, 2017. ^ Bertrand, Natasha. "Memos: CEO of Russia's state oil company offered Trump adviser, allies a cut of huge deal if sanctions were lifted". Business Insider. Retrieved December 1, 2017. ^ Withnall, Adam; Sengupta, Kim (January 12, 2017). "The 10 key Donald Trump allegations from the classified Russia memos". The Independent. Retrieved December 29, 2017. ^ Bertrand, Natasha (January 27, 2017). "Memos: CEO of Russia's state oil company offered Trump adviser, allies a cut of huge deal if sanctions were lifted". Business Insider. Retrieved December 29, 2017. ^ Roazen, Ben (February 21, 2017). "What Else Does the Donald Trump–Russia Dossier Tell Us?". GQ. Retrieved December 29, 2017. ^ Raju, Manu; Herb, Jeremy; Polantz, Katelyn (November 7, 2017). "Carter Page reveals new contacts with Trump campaign, Russians". CNN. Retrieved February 9, 2018. ^ Apuzzo, Matt; Drucker, Jesse; Haberman, Maggie (May 22, 2018). "At Trump Tower, Michael Cohen and Oligarch Discussed Russian Relations". nytimes.com.